Technology is an equal-opportunity destroyer. Over the past 20 years, I have seen it disrupt the traditional business models of photo labs, printing companies, and publishing firms. It has also altered the careers of people involved with those businesses, including photographers, designers, and writers. Some people adapted, embracing new opportunities and overcoming the obstacles and uncertainties associated with new technologies. Others simply fell behind. So when I went on an “Agency Crawl” organized by AIGA Cincinnati earlier this year, I wasn’t surprised to see that the traditional “ad agency” business model has vanished. As technology rapidly alters how information is created, delivered, and shared, creative design firms have adopted new missions and updated their services. It was fascinating to see how creative-services agencies are reinventing themselves. So I proposed writing a series of articles on contemporary design agencies. WCPO.com recently published the first two articles in the series. In one article, I interviewed Brian Keenan, a co-founder of Openfield Creative. I met Brian when I visited Openfield Creative during the AIGA Agency Crawl. 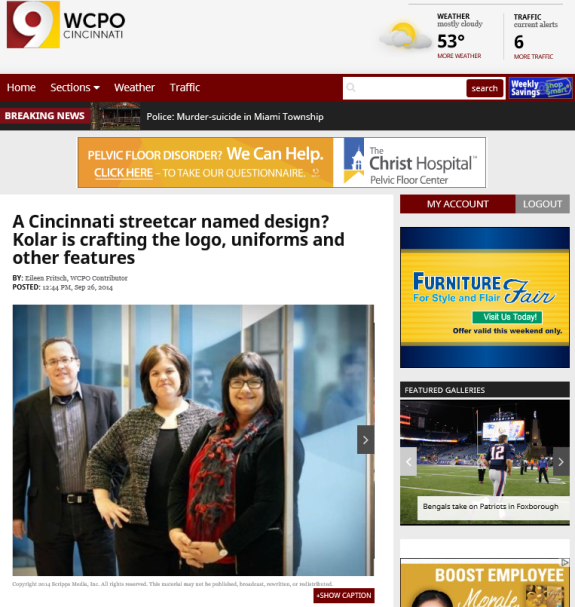 For the other article, I interviewed Kelly Kolar of Kolar Design and two of her team leaders Mary Dietrich and Bill Thiemann. I met Kelly at the ISA Sign Expo, where she gave a presentation as part of an educational program organized by the recently renamed Society of Experiential Graphic Design (SEGD). Both agencies actively help their clients adapt to ongoing changes in how brands and organizations communicate with their customers, partners, and employees. At Openfield Creative, designers are currently helping brand owners engage customers through easy-to-use websites and apps. But Keenan was reluctant to pigeonhole the firm as an “interactive agency.” He noted that if the Internet disappeared tomorrow, Openfield Creative would still be focused on helping clients develop strategies for dealing with change. Kolar Design focuses on design elements that affect the type of experience clients and employees have when they visit or work at a cleint’s facilities. Experiential graphic design (formerly known as environmental graphics) uses a combination of art, printed graphics, signage, and interactive technologies to help clients from the public, private, and healthcare sectors reinforce their brand mission, vision and values through the built environment. Kelly’s Sign Expo presentation on experiential design for healthcare facilities was an eye-opener for any graphics-printing firm seeking insights into the changing needs of their customers. Now that the first two articles in the series have been published, I am contacting other design firms to hear their stories. Because I continue to write stories for magazines that cover the ongoing transformation of the printing business, I realize how easy it can be to make generalized, outdated assumptions about designers and ad agencies. What I am discovering is that each creative-services agency seems to be as unique as each reinvented printing business has become. Change has disrupted us all and we are reinventing ourselves in different ways.